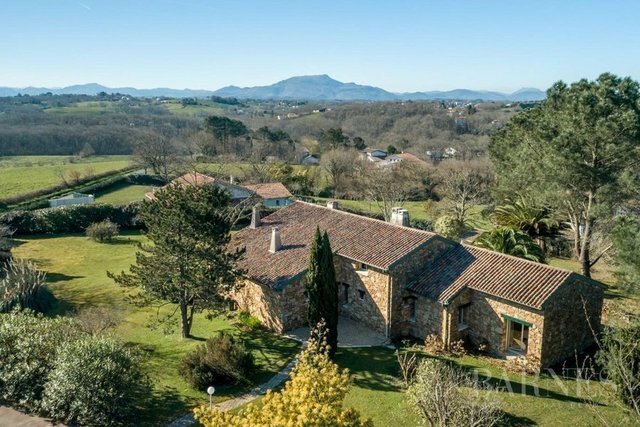 Arbonne, 2 minutes from Arcangues golf course, this beautiful property in a peaceful neighbourhood includes a 280 sqm main house with a living and dining room opening onto the terrace and 3 bedrooms. South-oriente, the house offers a splendid view of the mountains. The 6.200 sqm land is landscaped an a pool and a pool-house. 70 sqm guesthouse with lounge, bedroom, kitchen and bathroom. Large garage and carport.